Portrait of Tenskwatawa, or "The Prophet." Tenskwatawa worked with his brother, Tecumseh, to unite American Indian tribes in the Northwest Territory to defend themselves against white settlers. In 1811, the Battle of Tippecanoe was a significant defeat for Tecumseh's American Indian Confederation. Tecumseh and the Prophet, also known as Tenskwatawa, were the American names of two Shawnee natives. They also were brothers. During the early 1800s, they devised separate plans to deal with the white settlers flooding onto their land. According to the Prophet, the Master of Life told him that the American Indian must give up all white customs and products. If they rejected these items and returned to traditional ways, the Master of Life would reward them by driving the white settlers from the American Indians' lands. Tecumseh believed, if the American Indian put aside their traditional differences and worked together, that they would be able to stop white encroachment onto the American Indians' land. Tecumseh's Confederation became linked with his brother's religious movement. In 1808, the brothers moved their followers to Prophetstown near the Tippecanoe River in the Indiana Territory. The two men continued to spread their messages, and their followers continued to grow in number. By 1811, such a large number of American Indians lived at Prophetstown that white settlers in Ohio and the Indiana Territory demanded that the government do something to protect them. William Henry Harrison, governor of the Indiana Territory and future president of the United States of America, led an army against Prophetstown in the fall of 1811. He stopped his force a short distance from the American Indian village. Tecumseh was away, recruiting other American Indians to join his confederation. The Prophet, lacking the military skills of his brother, decided to attack the Americans. He claimed that the Master of Life had come to him and told him that the American Indians would succeed in defeating the Americans. He also stated that the whites' bullets would not harm his people. The Prophet and his forces attacked Harrison's men before daybreak on the morning of November 7, 1811. Harrison's army had approximately one thousand troops, including infantry and cavalry. The American army defeated the American Indians, but they suffered heavy losses: sixty-two men killed and 126 wounded. The American Indians' losses are not easy to know because they carried off most of their dead and wounded. Harrison guessed that at least forty American Indians were killed. This battle became known as the Battle of Tippecanoe, which occurred north of present-day West Lafayette, Indiana. The American army drove off the American Indians and burned Prophetstown to the ground. Most natives no longer believed in the Prophet. Many returned to their own villages after the defeat. Tecumseh tried to resurrect his confederation, but many people refused to join him again. Tenskwatawa's claims of invincibility contributed significantly to the collapse of Tecumseh's American Indian alliance. 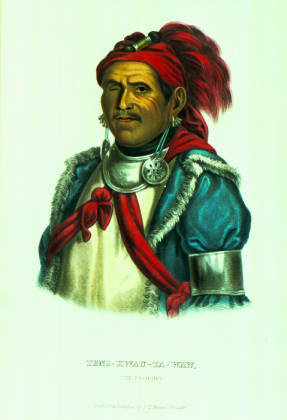 While Tecumseh's confederation was weakened after the Battle of Tippecanoe, Harrison's fortunes increased as he became known as "Old Tippecanoe." Many years later, he used his reputation to run for President of the United States. His campaign slogan was "Tippecanoe and Tyler too!"